After many years of negotiations among Member States, a uniform set of private international law rules has been established to determine the conduct of cross-border insolvency proceedings within the European Community. This is the European Insolvency Regulation of May 2000. Although each state still retains its own insolvency law, the regulation greatly reduces the risk of opportunistic behaviour by providing certainty as to which European courts have jurisdiction to open insolvency proceedings and which state¿s laws apply, in addition to ensuring the cross-border effectiveness within the EU of the decisions handed down by those courts. special considerations affecting credit institutions and insurance undertakings. Company lawyers handling insolvency cases and issues will find nothing comparable to this expert work. Its direct practical usefulness is immediately apparent. 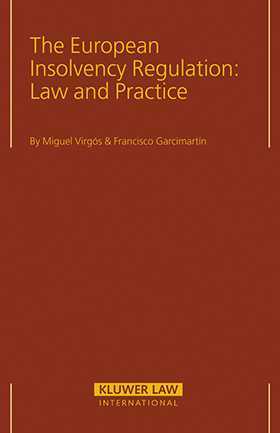 In addition, however, it stands out as a preeminent work on a critical and hard-won legal instrument (and by extension on the entire field of European insolvency law) and as such is an essential resource for jurists and legal academics. Part I: General Issues. 1. The European Regulation on Insolvency Proceedings: Legal Basis and Content. 2. The Normative Model. 3. Sphere of Application. Part II: The Main Insolvency Proceedings. 4. International Jurisdiction. 5. Applicable Law: The General Rule. 6. Applicable Law: Exceptions. 7. Applicable Law: Uniform Rules. Part III. Territorial Proceedings. 8. Territorial Proceedings. Part IV. Recognition and Enforcement. 9. Recognition of Foreign Insolvency Proceedings. Part V. Coordination. 10. Coordination between Insolvency Proceedings. Bibliography. Index.